How to prepare for a new kitten - have you got everything in place for your kitten's arrival? Prepare everything in time for bringing your new kitten home. Experiencing a new home is daunting for a tiny kitten, as he is leaving his mum, siblings and the home he was born in. Therefore the transition should be as smooth as possible, in order to help your kitten settle into his new home. When you have a new kitten, you need to see your home through completely fresh eyes, as there are so many potential dangers, which might not affect humans, but could seriously injure tiny kittens. Follow our tips on how to ensure your home is not only kitten-friendly but also kitten-safe. Wires - cables for your TV, table lamps, or phone chargers may tempt an inquisitive kitten as a game or something to chew. Tidy them away, fit cable tidies or block the kitten's access. Chimneys - a dark hole can prove very appealing to a curious kitten who could climb up and get stuck. Buy a fireguard, and, when not in use, block your chimney. Flowers and plants - many plants are toxic to cats, including lilies, azalea, cyclamen, and chrysanthemums, so keep these out of your house. Hot drinks - a mischievous kitten may knock your cup over and risk being scalded, so keep them safely out of reach. Curtains - curious kittens are notorious for scurrying up curtains, so if you have floor-length curtains, you may want to consider swapping them for sill-length drapes or blinds (keeping the latter fastened up safely). Hot hobs - keep your kitten off worktops for safety as well as hygiene reasons. A hot cooker can cause nasty burns. Fridges - tiny kittens could easily hop in unnoticed when you are putting milk away, so always beware of where your kitten is when you are in the kitchen. Cleaning products - bleach, disinfectant, laundry liquids and powders are toxic to both humans and cats, so store in a cupboard fitted with a child lock. Mop up spills immediately. Appliances - washing machines and tumble dryers are tempting hiding places, and cats have been known to endure a wash or dry cycle because their owners hadn't realised they were inside. Keep the doors closed and check before switch on. Iron - an ironing board is a tempting platform for a kitten to jump onto - and potentially send flying! Don't turn your back for too long when ironing and store the hot iron and board away as soon as you've finished. 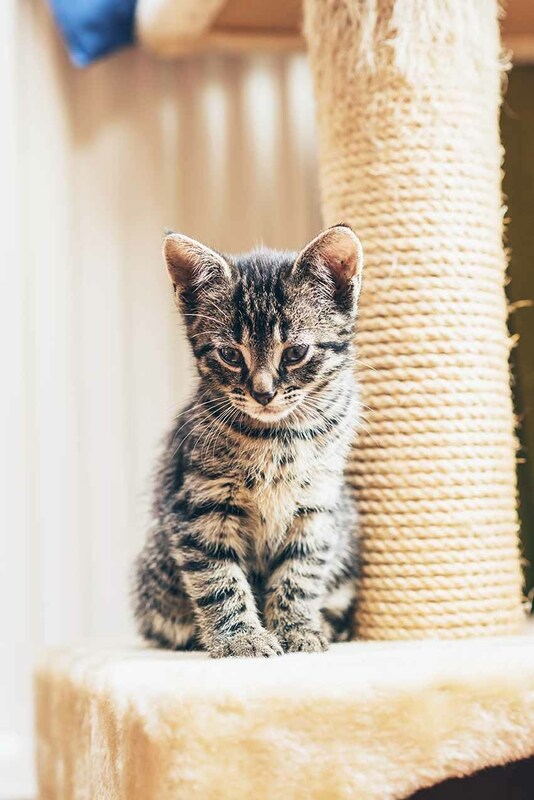 Stairs - kittens may end up with nasty injuries if they fall through the bannisters, so invest in a stair gate that your kitten can't climb through or up and over, or block the gaps between the bannisters with a thick cardboard sheet. Beauty products - toiletries such as deodorants, body lotions, and hair products contain ingredients that are potentially poisonous to kittens, so store and use them carefully. Hair straighteners/curlers - these can cause nasty burns if left lying around when hot. Place them somewhere safe for them to cool after use, and be careful with the flex as some cats will be tempted to chew it. Toilet - always keep the toilet seat down. Kittens can be fascinated by the swirling water and could leap in, putting them in danger of either drowning or being poisoned by any toxic chemicals in the toilet bowl. Bath - never leave a bath running or full bath unattended, as a curious kitten could fall in, be scalded, or drown. Medicines - it's vital to keep all medicines safely locked away, as it can be tempting for a kitten to play with loose pills, or worse, chew them, with dire consequences! You need to be fully prepared for when your kitten comes home, and you will need to buy all the necessary equipment before bringing your new kitten home. 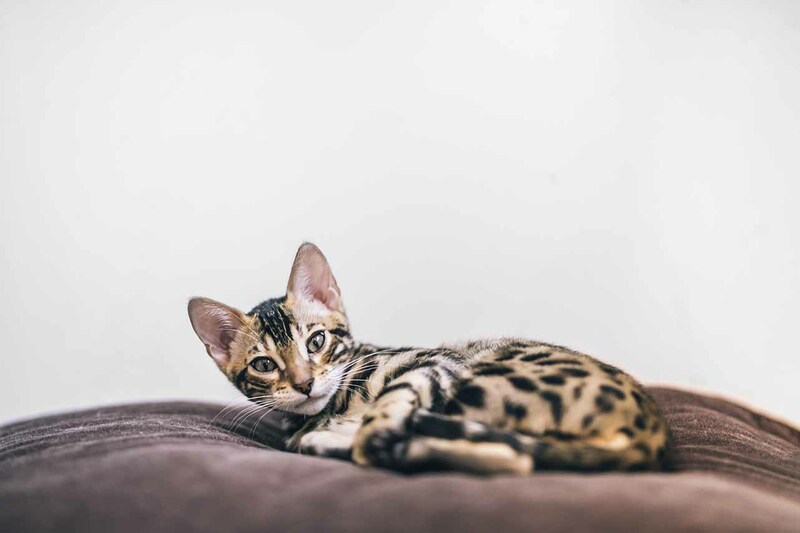 Follow our essential equipment guide, to ensure your kitten settles into his new home, and has everything he could possibly need. Your kitten's litter tray should be located in a discreet and quiet place, away from his water and food bowls. Position away from large windows or cat flaps to avoid disturbance, which could prompt toileting issues. Do not be tempted to buy cheap cat litter, instead opt for a specialist kitten litter, which will be soft on his delicate paws, locking fluid away effectively. Remember to clean the litter tray regularly, as kittens are very sensitive to smells and if the litter tray is dirty, they may be putting off using it. Kittens love to play and enjoy practising pouncing and chasing skills, so buy toys such as fishing rod-style toys, teasers and catnip mice. 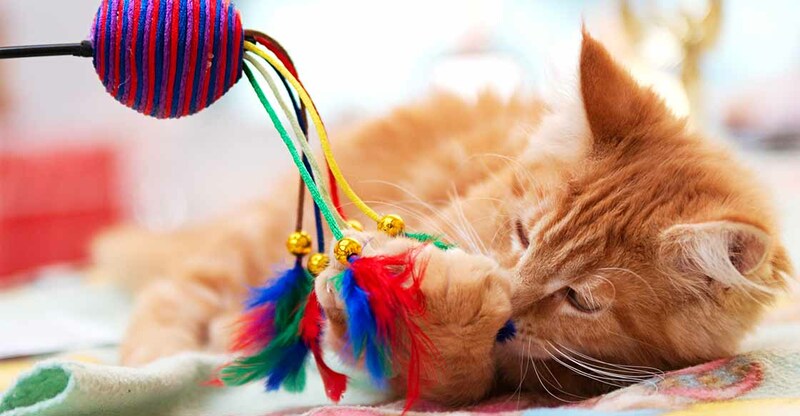 It's important to encourage appropriate play with cat toys, rather than with your fingers or toes as you'll only encourage him to pounce on your hands and feet as he gets older, which will be painful! A kitten will instinctively sharpen his claws and mark his territory by scratching, so to save your furniture from being shredded, provide a scratching post, which he can scratch to his heart's content. To encourage him to start using it, try applying a feline pheromone spray on the post, or perhaps a sprinkle of dried catnip. It's important to get your kitten used to being groomed, especially if he is particularly fluffy or has a thick coat. Even if he only has a short coat, he will need grooming, so it's an important routine to get established. Ask your breeder about your kitten's coat and for advice on the appropriate tools to buy. Generally, it is worth investing in a good quality brush for a daily grooming, and a comb to get any mats before they start. Have low-profile bowls so your little kitten can reach his food with ease. Look for bowls with rubber grips on the base to stop them sliding on polished floors. This can be a godsend when you go out or during the night so you can be sure that your kitten is not getting into mischief or coming to any harm. Essential for trips to the vet or cattery, and of course for bringing your kitten home. Make sure you choose one that's secure and easy to get the cat in and out of and large enough for him as he grows. You can start preparing your kitten for his journey home by swapping your scent to give him a comforting smell of his new home. In the days leading up to him coming home with you, leave a blanket or a worn item of clothing, such a t-shirt or jumper, in his bed, and bring a blanket he already has back with you to place in his bed. Before bringing your kitten home, you will need to set his room up. It's best to choose a room where your new kitten can be kept for the first few weeks, to adjust gradually to his new surroundings. This confinement also aids toilet training and avoids the risk of 'accidents' elsewhere in your house. Your kitten's room should ideally be a quiet, spare room in the house, and, as he'll spend most of his time in this room, make sure it is not only safe and secure but has everything he needs in the right place too. Provide your kitten with places to hide, such as a cardboard box, or space under a bed that he can retreat to if he feels nervous or tired. Place his bed somewhere quiet, with his familiar-scented blanket inside, and put his scratching post in another area of the room in full view. When you arrive home, take your kitten upstairs into his room, place the cat basket on the floor gently, and open the lid, allowing the kitten to explore his new area. Don't be surprised if he takes a while to come out of the carrier, as he may be nervous initially, so allow him to do so in his own time. Once your kitten has had a look around, show him where his litter tray, bowls and bed are, and sit in the room with him for a while, talking softly and quietly. Once your kitten seems comfortable, you can leave the room for an hour or so to let him explore in peace. 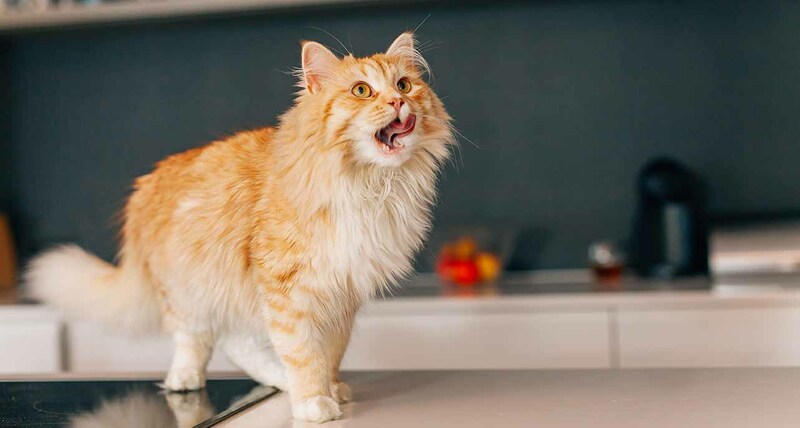 Check back in with him periodically throughout the day, and if he seems happy and inquisitive, try playing with him with a fishing rod toy or a catnip mouse. If he hides away, just sit quietly in the room and let him do things at his own pace. Following these steps, and continuing to interact with your kitten in a positive way, should help him grow into a happy, inquisitive and confident cat.